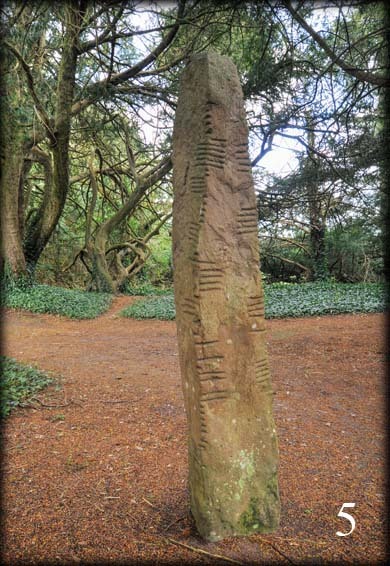 There are five ogham stones situated in a small grove on the grounds of Adare Manor. At least two of the stones. numbers 1 and 5, were found in a soutterain at Rockfield in Kerry, and subsequently used in the building of a cottage at Laharan. Lord Dunraven had them moved to his mansion here in Adare. 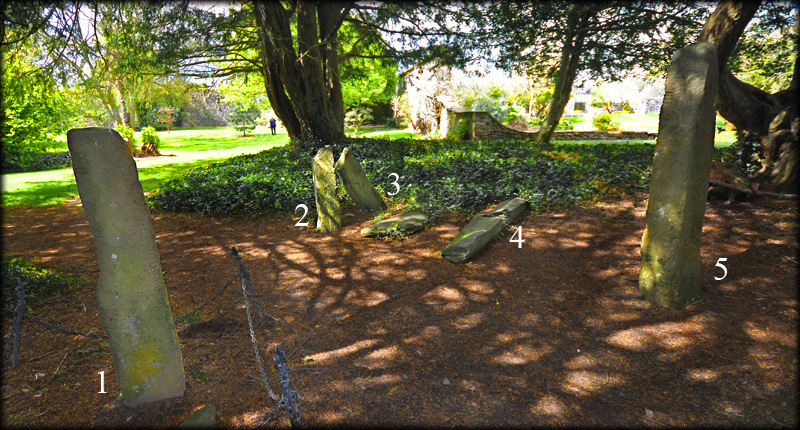 There is an unmarked stone lying on the ground between stones 3 and 4. Situated: On the grounds of Adare Manor. Security will let you in unless the Manor is booked for a function. Go straight past the Manor and gardens. The roads bends to the right, go straight into the gap in the trees on your left. Discovery Map 65: R 4717 4595. Last visit April 2012.